With the deadline for GDPR fast approaching, all eyes are turning to compliance, security, and how we look after our data. 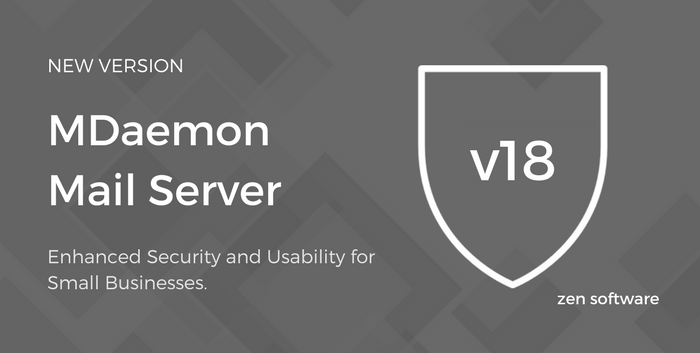 MDaemon 18 is the latest offering of the mail server that enables business owners to remain in total complete control of both security and every other aspect of their email communications. In this latest major release, Texas-based developer Alt-N Technologies add yet more features to boost security and improve usability. If you download the MDaemon installer from our website you’ll notice you no longer need to download the components separately, and the whole thing will now be delivered via your t’Interweb pipe as a single file. This change is primarily aimed at helping new trialists experience everything the product has to offer more easily. The license key system remains the same for existing users. The change means the names are now more self-explanatory and cause less confusion with SecurityGateway for Exchange in particular, which is Alt-N’s spam and virus product similarly named to the MDaemon security add-on. The way a DNS attack works is that an attacker will attempt to compromise a DNS address so that visitors are rerouted to an attacker’s site in an attempt to get hold of that person’s personal data. In version 18 of MDaemon, you’ll find that DNSSEC is now capable of being used (when available from your DNS provider), which is a good way to help ensure that MDaemon doesn’t become a victim of these attacks. PGP is now the default recommendation for anyone looking to encrypt their email communications in MDaemon. Users can use the Advanced Options screen to instruct MDaemon to encrypt the message, retrieve their public key, or retrieve the public key of another user (if available). 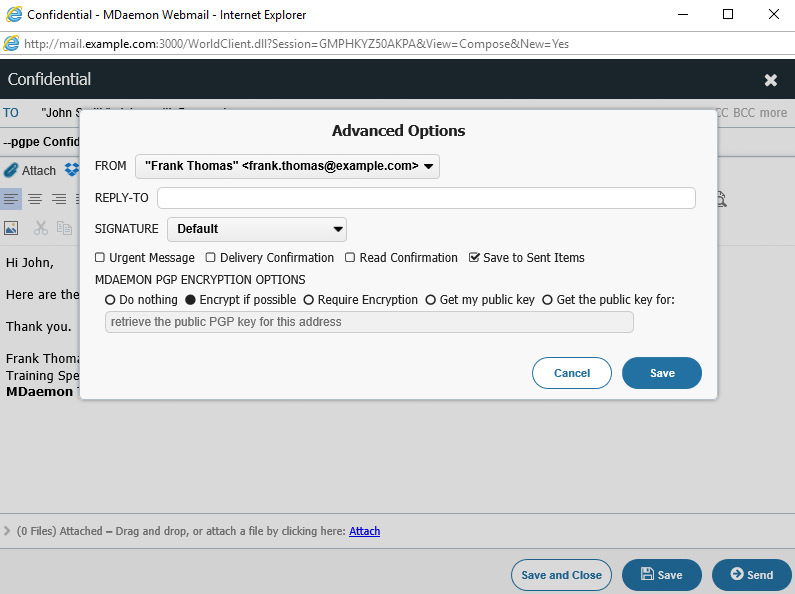 How to set up email encryption for MDaemon. Apparently, if you use email for business then a good practice is to aim for the nirvana of ‘inbox zero’ each day. Tidy inbox, tidy mind and all that. A handy tool to help you achieve this new state of inner peace is MDaemon’s new snooze option, which allows you to simply make a message disappear for a predefined time. The idea is that this approach makes prioritising your replies easy, and it lessens the chance you’ll leave messages sat in your inbox that you know you should deal with, but that slowly become invisible to you because they’ve been there so long. So yes, snooze. It’s the future. Go try it out. 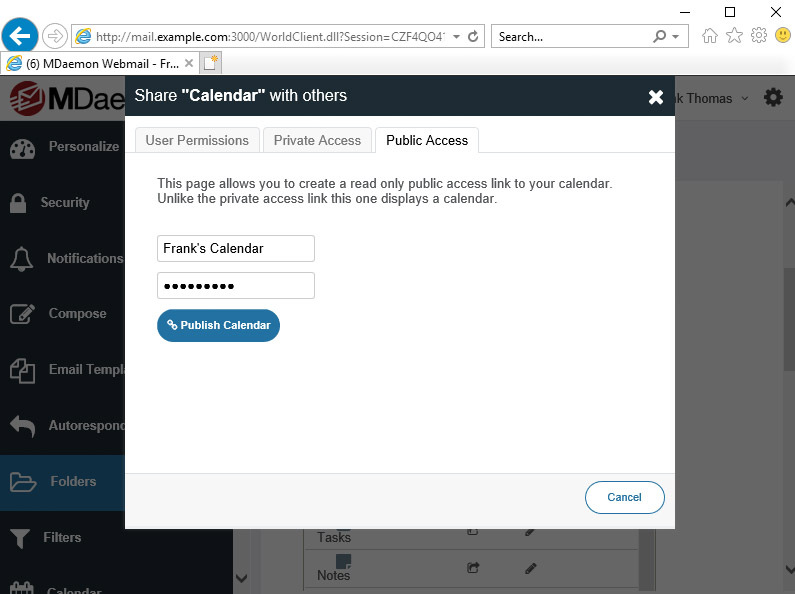 If your organisation has a calendar your peers or clients would find it useful to see, but it’s not appropriate to add them as users in MDaemon, this new feature is the one for you. 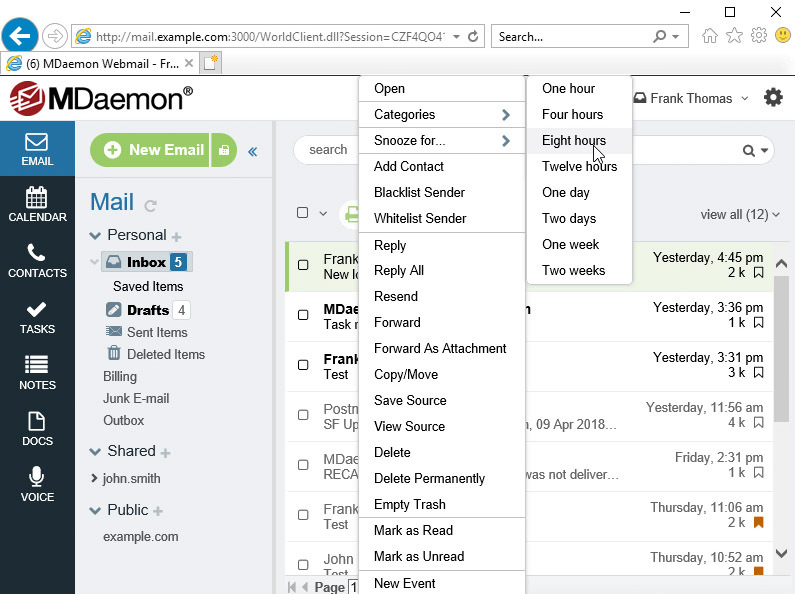 Use Webmail to publish an individual or public calendar to a password protected URL, viewable in all common browsers. Ideal for websites, intranets, social channels and more. More information on how to enable this feature globally or on a per-user basis can be found in the MDaemon release notes. Getting a taste for technology that talks back to you? Looking to save mileage on your eyeballs? Let the soothing voice of MDaemon speak your messages in an accent you’ll almost be able to place. 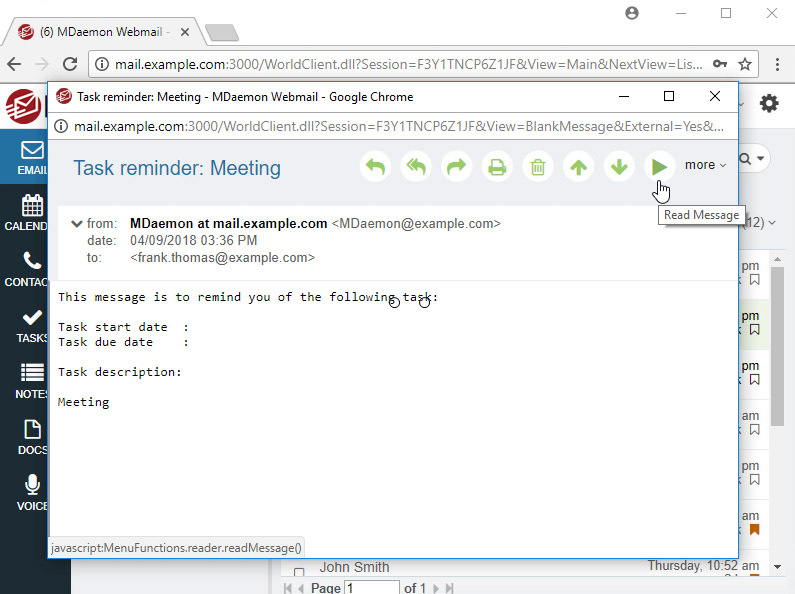 Click a button to listen to messages in Chrome or Firefox via MDaemon’s webmail client. The rate at which new viruses appear and old ones evolve could almost be deemed impressive were it not for the massive inconvenience and expense they cause businesses everywhere. 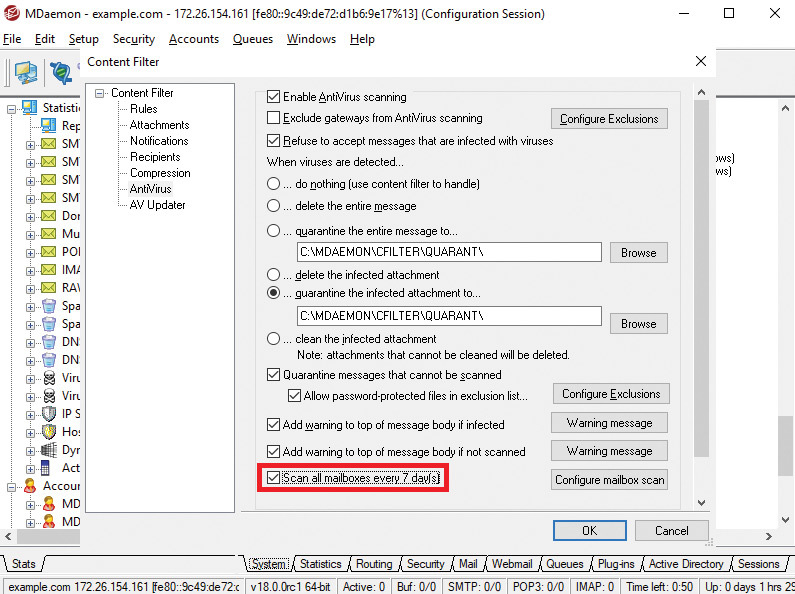 The landscape for these things is moving incredibly quickly, and a useful feature introduced in this release for MDaemon is the ability to schedule a full virus scan of mailboxes. With it, administrators can benefit from checking old mail using the most up to date definitions, catching anything on the rare occasion it was missed the first time. In version 17.5 we saw the introduction of country filters, which would block senders from particular locations, by checking their IP to establish where they are in the world. The only drawback of this is of course that you may wish, at times, to have access from other parts of the globe yourself, via mobile device or laptop most commonly. With that in mind, it’s now possible to configure an exception which states that certain ActiveSync devices are exempt from these checks. You are of course entitled to a free upgrade to v18.0 if your licence is current (you can check here) – otherwise, you can simply renew your key to both bring it up to date with the latest version and reinstate your free technical support.